I'm praying for fall as soon as possible but in the meantime you and your kids can cool off watching Fanboy & Chum Chum Brain Freeze out on DVD. Connor is absolutely obsessed with this wacky super hero duo and I can't blame him as they are pretty silly and like Connor it seems they are always getting themselves into trouble. This dvd is purely dedicated to Fanboy and Chum Chum's favorite treat, the coveted Frosty Freezy Freeze! All seven episodes are about the drink and what the boys will do to get their hands on one! 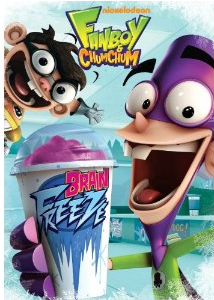 Brain Freeze - Fanboy and Chum Chum discover that their favorite Frosty Freezy Freeze flavor, Berry Pink, is about to be discontinued. Determined to have as much as they can before it’s gone forever, they end up with a massive brain freeze. The next morning, Fanboy and Chum Chum wake up with no memory of what happened and their signature tighty-whiteys are missing. They must retrace their steps to find out how their crazy night unraveled so they can find their precious underwear and restore order. Berry Sick - During a summer heat wave, the boys discover the Frosty Freezy Freeze machine is on the fritz. It’s up to Fanboy and Chum Chum to get the Berry the Ice Monster, the machine’s operator, back in good health. Refill Madness - Lenny and Boog learn that Fanboy and Chum Chum have a valuable cup that entitles them to endless free refills at the Frosty Mart. The two decide to work together to try to steal the cup. The Frosty Bus - Fanboy and Chum Chum are waiting for the Frosty Bus to buy a Frosty Freezy Freeze. Unfortunately, Boog is driving and torments them by always keeping their beverages just out of reach. Jingle Fever -When Fanboy and Chum Chum find out they can win a million Frosty Bucks by writing the new Frosty Mart jingle, Lenny does everything in his power to stop them. Back from the Future - After Fanboy and Chum Chum show Lenny that Dollar-nator is a time machine, he decides to use him to travel back in time and prevent Fanboy and Chum Chum from ever tasting a Frosty Freezy Freeze. But despite his greatest efforts, the boys somehow always end up discovering Frosty Freezy Freeze. Norse-ing Around - Fanboy and Chum Chum discover a frozen Viking in their icebox and decide to help him “achieve glory” so he can get into Valhalla. Connor especially loves the episode where the Fanboy and Chum Chum get the brain freeze and loose their underwear. He will watch it over and over laughing hysterically each time. At first I really did think the show was a little on the silly side but compared to some of the other kid's programing these days I'd much rather see my kids laugh and enjoy a show verses put something on the tv that has too much violence or adult topics. Fanboy and Chum Chum is purely just good fun. You can pick up your own copy of Fanboy & Chum Chum Brain Freeze on dvd right now at Amazon ! Disclosure: We were given a copy of Fanboy & Chum Chum Brain Freeze free of charge, we were not compensated for this post in any other way. My opinions and comments on items we review are always my own and are never influenced by sponsors!